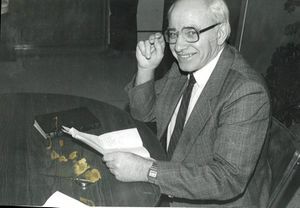 Dietrich Friesen (1924-1990), first minister of the Treesbank EM Church. Photo: Courtesy of Terry Smith. In the mid- to late 1960s a number of Mennonite families moved to the Wawanesa and nearby Treesbank, Manitoba, areas to farm and start a new church. Seven families jointly purchased the Sundell farm in 1966, built hog and poultry barns, and started farming—some more successfully than others. In years to come more families moved into the Wawanesa community. These families came from a number of different church communities, like Ridgewood, Blumenort, Landmark, Morris, and Rosenort, all in southern Manitoba. The first organizational meeting was held on 22 November 1966, at the Ed Wiebe residence. This was only a temporary organization. At this meeting it was decided to set 1 July 1967, as a target date when a church would be fully organized. It was expected that more families would move into the area within a year from the Blumenort and Morris areas. Services were held in the basement of the home of Ed and Violet Wiebe for one winter. In 1967 as more families moved into the area, the Treesbank School was purchased and became the first church building. In June of that year the church was fully organized with a total membership of 34. The name of the church was Treesbank Evangelical Mennonite Church, which reflected the denomination from which most of the people came. A few years later the church building was renovated and enlarged to almost twice its original size. In 1979 a major construction project resulted in a much larger sanctuary, large open basement, and a larger entrance and foyer. The older part was again renovated and changed into Sunday School rooms, office, and coat room. Diedrich Friesen, a former associate minister from the Blumenort EMC, was elected to be the first pastor; he was self-supporting with his family’s grain and turkey farm. Later on Pastor Friesen relinquished some farm work and spent more time directly in the pastoral duties, at which time the church began to support him financially to some extent. In 1979 Pastor Friesen felt called to accept a chaplaincy ministry at Stony Mountain Penitentiary. By 1983 the pastor of Treesbank Church was fully financially supported by the church and serving the church and the community full-time. The church has been served by a number of deacons, including C. P. Dueck, F. P. Thiessen, Ed Wiebe and Leonard Plett. In the mid-1970s and later a number of families, and especially second generation families, moved back to their former communities. Some moved on to other places for education, employment or just to get away from a rural lifestyle. As of 2016 several of the original pioneers included Ellen Plett and Esther Plett, and children and families from the original families. Back in the 1960s the congregation had Reimers, Thiessens, Friesens, Wiebes and Pletts. By 1998 the name of the congregation had changed to Treesbank Community Church, as a second generation of people started to take more leadership and the name “Mennonite” seemed to be a barrier for some people. New family names among the participants included Clark, Hamilton, Street, Brown, Degerness, Hallam, Waddell, Heinrichs and others. Although people came and went, and programs changed from time to time, the purpose of the Treesbank EMC / Treesbank Community Church remained much the same over the years: To celebrate God’s love and radiate that love to the community around. Its all important message was that Jesus Christ came into the world to redeem humankind, and to bring peace and meaning into the life of every person. The church has sought to fulfil this goal by promoting different ministries in the community, which included a singing ministry at the hospital and Personal Care Home, Vacation Bible School or Summer Day Camp for children, Bible Study groups, and regular worship services in the church. Messenger (23 December 1988): 7. Plett, Leonard. "Treesbank Community Church (Wawanesa, Manitoba, Canada)." Global Anabaptist Mennonite Encyclopedia Online. November 2017. Web. 18 Apr 2019. http://gameo.org/index.php?title=Treesbank_Community_Church_(Wawanesa,_Manitoba,_Canada)&oldid=156152. Plett, Leonard. (November 2017). Treesbank Community Church (Wawanesa, Manitoba, Canada). Global Anabaptist Mennonite Encyclopedia Online. Retrieved 18 April 2019, from http://gameo.org/index.php?title=Treesbank_Community_Church_(Wawanesa,_Manitoba,_Canada)&oldid=156152. This page was last modified on 13 December 2017, at 19:15.